Frank and Indy have successfully hatched and raised many eaglets. On March 24, 2017, at 8:27 p.m. (EST), Indy laid her first egg of the season, followed by 2nd egg laid March 28 at 7:22 p.m., and a 3rd egg April 1, 2017. We were disappointed that Indy and Frank’s eggs did not hatch this season, but not every season is successful. As of 2017, Independence and Franklin have successfully raised 26 eaglets which were all released from our hack tower on Douglas Lake (25 of those eaglets were biological offspring of Frank & Indy, while one of them was a foster eaglet named “Miracle”). The pair also laid 4 eggs which were hatched and raised by another pair at the AEF, three of which successfully fledged from our hack tower. 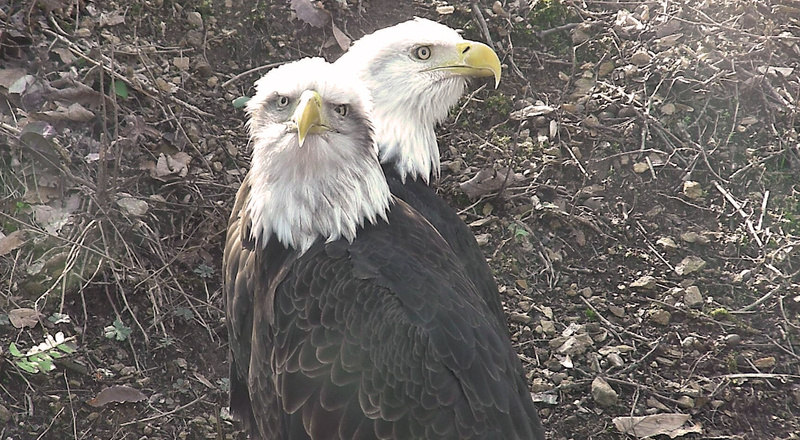 Indy and Frank resumed their normal behavior on Eagle Mountain Sanctuary and did well the remainder of the season. 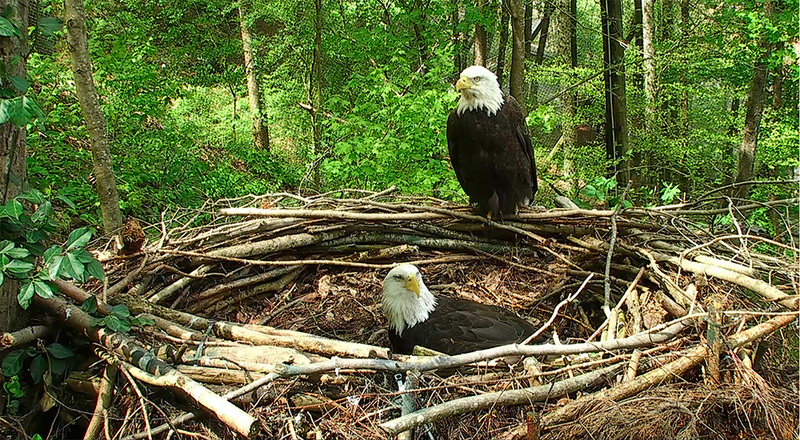 Eleanor and Mr Roosevelt were a featured nest during the season. Ellie and Roo bonded years after being transferred to AEF’s Pick-a-Mate aviary, and in 2016 they were placed in their own compartment in Eagle Mountain Sanctuary. During the 2017 season, Ellie laid two eggs. The first eaglet (ER2) hatched April 11 and the second eaglet (ER3) arrived April 13. Ellie and Roo did a good job seeing their eaglets through the first few weeks of their life. On June 1, 2017, the eaglets were removed from the nest and placed in AEF’s hack tower, where they successfully fledged July 25. At their physical examination, each eaglet (both males) weighed in at 8 pounds. Watch a video of the release of ER2 (Shaconage) and ER3 (Courage). 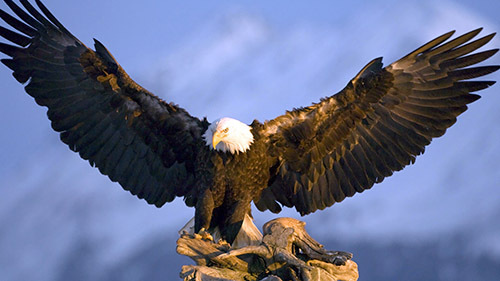 HB, another eaglet released, was the offspring of non-releasable Bald Eagles Honor & Braveheart. Staff fondly gave this eaglet the name “Little Honor” in honor of his parent. Ellie is sadly missed by everyone. 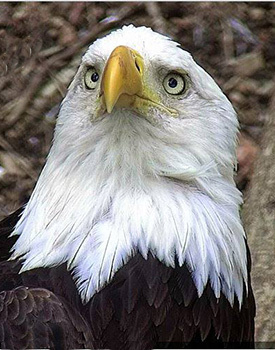 On January 17, 2018, our beloved Ellie was found deceased in the aviary compartment that she and her mate, Mr. Roosevelt, occupied. There was no apparent injury – no visible sign of trauma. She was immediately taken to the University of Tennessee School of Veterinary Medicine, where an initial necropsy was performed. All tests to date came up negative. When we receive the final report, we hope to be able to provide more information. As you may well imagine, this was a devastating event for all our caregivers. Roo has been placed in the Pick-A-Mate section, where we hope he will find another companion. Mrs. Jefferson (front) is easily identified by the dark patches on her face. Isaiah (in the back) has a pure white head. The nest cam for Mrs Jefferson and Isaiah was broken all season. Not having the ability to see into the nest gave no opportunity to watch the nesting season of this breeding pair. Prior to the cam malfunction, there were 3 eggs laid (Feb. 19, Feb. 22, & Feb. 25), but unfortunately none hatched. 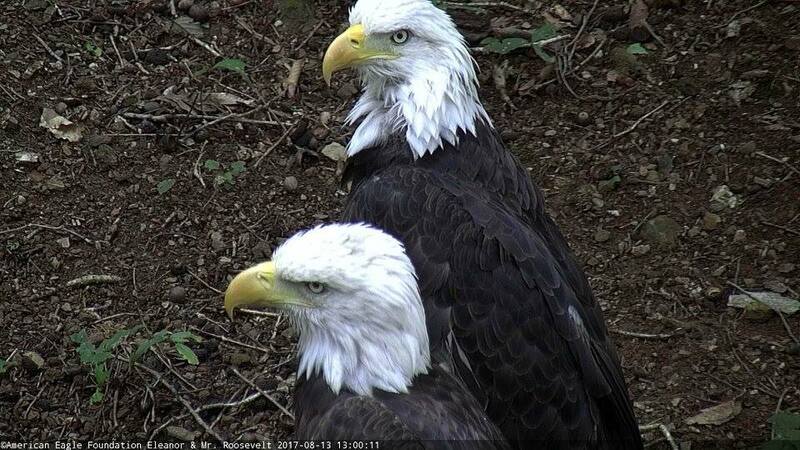 The pair are seen daily at Eagle Mountain and are doing well.